Mesodyne’s power generator reduces the battery load of researchers and infrastructure operators relying on remote unmanned instrumentation, dismounted warfighters, and operators using unmanned aerial vehicles by 75% resulting in increased capability and cost savings. 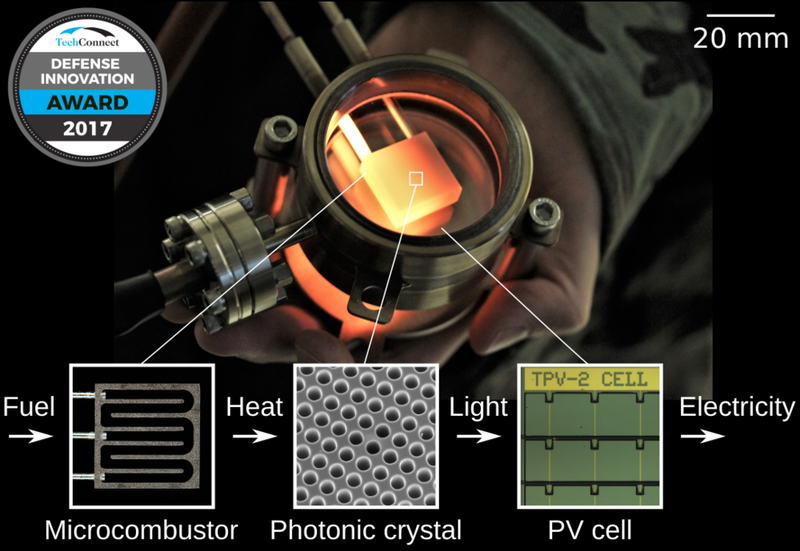 Developed at MIT’s Institute for Soldier Nanotechnologies and incubated at Argonne National Lab, the technology converts fuel to electricity in the 1-300 W range. Its small form factor with ultra high energy density of 800-1000 Wh/kg far surpasses even state-of-the-art batteries. Its multifuel operation requires no special fuels and is JP-8 compatible, unlike fuel cells. Its silent and static conversion process has virtually no moving parts, unlike conventional generators which are loud and bulky. Its ready-to-go operation means no downtime, long shelf life, and no sunlight needed. Mesodyne’s technology converts fuel into electricity with heat and light as intermediaries. Specifically, Mesodyne's thermophotovoltaic portable power generator works by burning fuel to heat a photonic crystal thermal emitter to incandescence, leading to infrared radiation which drives specialized photovoltaic cells to generate electricity. Simply put, Mesodyne delivers watts of electricity at the fuel flow of a lighter in the palm of your hand. Mesodyne’s fuel-to-electricity conversion process is a platform technology applicable to any application where performance is limited by battery weight or where all other sources of power (grid, solar, wind, etc.) are not available or practical. Stationary generator This product addresses remote industrial and scientific instrumentation and control stations that are impractical to power by solar, for example at high latitudes or beneath a forest canopy, or where space is not available. Mesodyne offers increased reliability and uptime and makes transportation to the remote site easier by reducing weight. Man-portable generator This product is primarily designed for dis- mounted warfighters on extended missions carrying 10-20 pounds of batteries. Mesodyne could offer a 75% weight reduction, allowing them to carry more ammunition and water. UAV power generator This product increases the endurance of fixed wing UAVs to several times that of batteries. We have conducted a handful of interviews in this area. Increased endurance is particularly useful when the UAV needs fly to a remote inaccessible site, perform its mission, and return. Low vibration from Mesodyne’s static conversion process is needed for accurate imaging.